Yeah … thank you. The rabbit seems to be doing a bit better this week, albeit at the cost of our doing some medical care she does not care for, including subcutaneous fluids. Still facing surgery next week but we’re more confident she’ll make it to the operating table. They are family yes, and ours is smaller than it was a weekend ago. 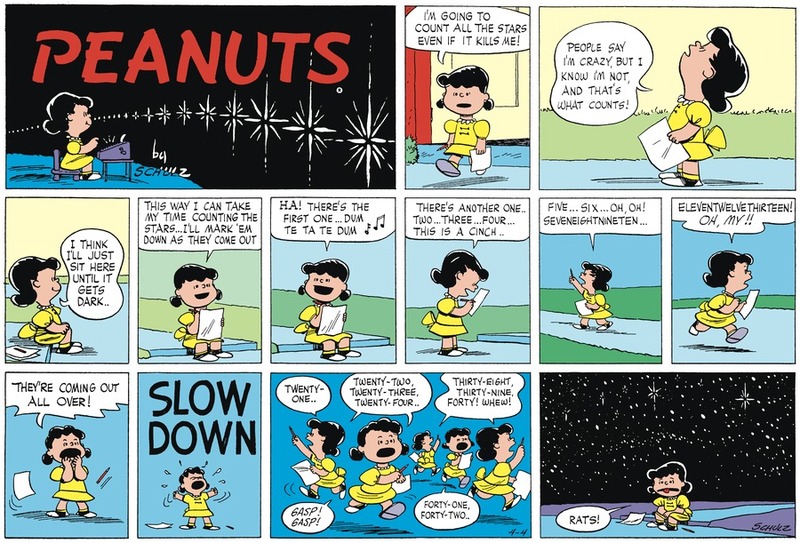 Now at least Lucy knows how Linus (felt/will feel) depending on the Peanuts timeline when (she told/will tell him ) that he embarrasses her for patting birds on the head. I remember reading that sequence in a Peanuts reprint paperback when I was around Linus’ age and thinking how cool it would be to actually be able to pat birds on the head. Will feel, for this point in time. Linus was in the strip, but he was still a baby, doing stuff like hiccoughing all day for want of anything better to do. Also yeah, I never got what Lucy was upset by when Linus (and later, Rerun!) petted birds on the head. That seemed like a sweet position for Linus/Rerun to have. Lucy should’ve known better.